Living in an urban or suburban environment, far away from “the country” doesn’t mean that you miss out on the best produce of spring and summer. The rise in popularity of farmers markets brings a great variety of fruits, vegetables and other gourmet ingredients. 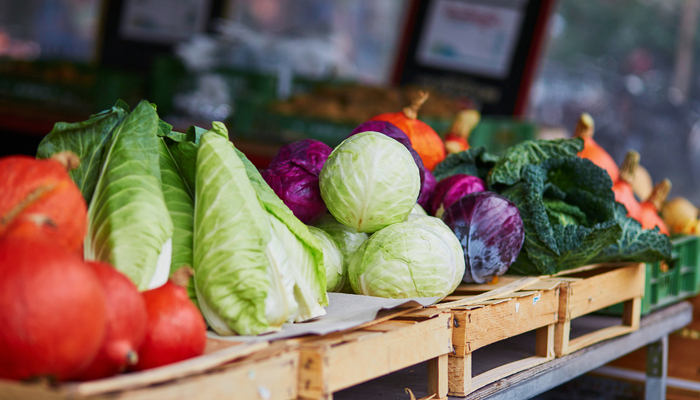 Whether you live in a luxury apartment in DuPage County or a neighborhood home in the city, you can still enjoy an impressive selection of locally grown produce. Below is a list of what to look for, and what to do with your scores, on your next farmer’s market visit. Carrots – Did you know that carrots aren’t just orange? Farmers markets are a great place to find several varieties of carrots. These root vegetables come in a variety of hues, not just orange. In fact, the purple variety is higher in antioxidants and beta-carotene than all others. Carrots at the farmers market are usually sold “whole”, meaning the stems are still on and they are unpeeled. This gives them a longer shelf life than their grocery store counterparts. Serve raw carrots cut up with a dip such as Greek yogurt ranch dip (a healthy twist on a Midwest staple) or serve up a vintage throwback like glazed carrots. You can be extra adventurous and try using the leafy green tops in a carrot-top pesto. Heirloom tomatoes – Though not picture perfect, heirloom tomatoes from the farmers market are fresh and offer an intense tomato-y flavor. Grocery-store tomatoes are often picked far from where they are sold and spend a lot of time in refrigerated trucks or cases where they lose flavor and nutrients. In all, there are 32 different varieties of heirloom tomatoes and they come in an array of colors including black, purple, yellow, pink, green (not to be confused with “green tomatoes” which are tomatoes that are not fully ripe) and of course multiple shades of red. Serve tomatoes in a fresh salad with an herb vinaigrette for a cool summer appetizer. Local honey – The flavor and color of honey are determined by the flower of the nectar from which it was made. So, not only is honey sourced locally but the honey you buy is also inspired by the region as well. Make sure you check the label or talk to the stall vendor. Try to buy honey as close to you as possible, to ensure it’s truly “local”. Honey can even vary by batch, depending on how the flowers were doing. Since farmers market honey can be on the pricey side its best to not cook it so the natural flavors come through. Stick to using it as a sweetener for tea or in a vinaigrette. Berries – Berries are available year-round thanks to advances in modern agriculture, but nothing beats the taste of in-season berries. Hot temperatures ensure that berries are at their peak sweetness when picked. Keep an eye out for all-time favorites like fresh strawberries or uncommon finds like tayberries (a hybrid of the raspberry and blackberry). Buy in bulk for strawberry preserves or serve cut up over ice cream.